These are strange economic times, with an undeclared (and unrequited) recovery existing apparently alongside an undeclared (and strengthening) recession. The economy is superficially partly one thing and partly the other, producing innumerable inconsistencies that should be more troubling than they are taken. Maybe that relates to the fact that almost six full years after the Great Recession was declared ended and the trillions in “stimulus” spent and conjured toward ending it, there isn’t much other than that amplified gyration to show for it. Instability is troubling enough on its own but it is also suggestive of statistical problems outside the “normal” paradigm. This is observed primarily of the employment statistics but you could certainly add GDP to the discussion. It is difficult to ascertain much of a certain interpretation when the figure can swing wildly from -3% to +5% and almost back again in the space of just five quarters. What is truly amazing about that is not the presence of just low lows and high highs but rather that GDP itself was constructed in the most favorable economic terms (adding government as a plus? ); in other words, GDP is meant to show the best growth possible. That it can’t maintain itself on a steady pace is highly suggestive of both structural deficiency and statistical unsuitability. There is more to say about GDP itself, especially since GDP ex inventory was about -3% again, but there are worse and more important indications than even that. The Final Sales accounts strip out some of the artificial and beneficial (for GDP’s view on growth) aspects and focus solely on the private economy at the point of sale. That means inventory is extraneous in terms of the private economy in the moment; the purchaser view also does not infuse imports with a negative sign, as we want to know how much private “demand” actually exists before entangling geography and currency systems in analysis. Of Final Sales to Domestic Purchasers, the statistical problems are evident straight away in Q1 2015. Real Final Sales, taking account of the official version of “inflation”, were $31 billion more than Q4 2014. However, Nominal Final Sales were $33.5 billion less quarter to quarter. Not only are the signs reversed, these are enormous discrepancies in that direction. Under ideal circumstances, such would be great fortune for the economy and a welcome respite from its monetary repression (buying more and paying less for it), but the unusual nature of this arrangement again suggests more statistical problem than actual economic benefit. 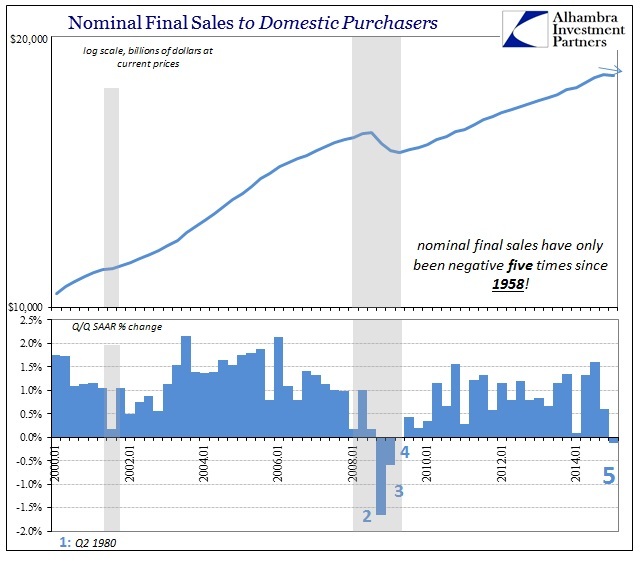 Seeing a negative nominal growth rate in final sales is highly unusual, which might as well be expected given that we have been under some form of an “inflation” appeal of monetary theory since 1965. 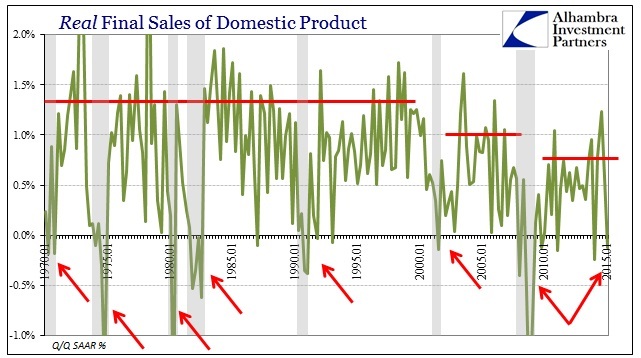 In the twin final sales accounting, Final Sales of Domestic Product, there have only been four instances of a negative quarter since 1958. Three of those were during the Great Recession, and Q1 just produced the fourth! We can argue about the official inflation calculation as to how bad everything might be, but a negative nominal rate removes the doubt. As if to confirm that dire interpretation, in Final Sales to Domestic Purchasers there have only been five negative quarters since 1958 (with Q2 1980 being the fifth/first). The rarity of these occurrences and their comprehensive association with nothing but recession is concerning about the degree of recession vs. recovery that may have, to this point, existed concurrently. In other words, the balance may be (may have been) shifting(ed) in the past year or so. There has been an evident problem with “demand” and the basis for the private economy going back to the turn of the century to begin with. The private economy has taken on a tendency to not grow as fast but leaving instead of steady growth this new design of instability; we get none of the highs with more frequent lows. That has allowed economists to miss this central point of emphasis in favor of some generic and overarching narrative – that since the economy is clearly not within full recession it must be in some form of recovery, even if only a slow and insufficient one. I think that is a false account, as instead this instability suggests something else entirely. The economy is like a boxer being dazed from constant blows, getting knocked down (“unexpectedly”) several times. The fact that the boxer has so far re-risen from each does not suggest that the boxer is now better prepared to handle the continued onslaught, that the next blow will not be the knockout. In fact, repeated knockdowns advise the danger of a knockout has only increased; at some point the economy won’t get back up. The menace of that goes well-beyond the boxer, as the amount of leverage piled into and onto nothing but expectations for positive (and even robust, if in the future) growth make any such sustained stumble absolutely dangerous. There is every reason to believe we literally cannot afford the knockout. There will certainly be debates about what and where those “blows” are coming from, as the entire point of “secular stagnation” is, to stay within the boxing metaphor, that the boxer is actually punching himself into a coma – the analogy works so well because secular stagnation as an economic theory is just that ridiculous. If there is anyone throwing and landing haymakers on the US economy, the origin is where the greatest deviation from trend has most readily occurred, the 500 lb, steroid-infused opponent operating simultaneously out of DC and NYC.